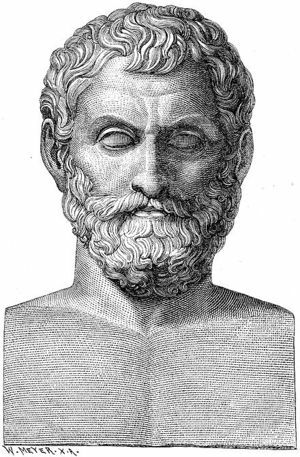 Thales of Miletus (624 BC - 546 BC) is considered by many to be "the first Greek philosopher". His denial of mythology as an acceptable explanation for natural phenomena is a fundamental component of the scientific revolution. He aimed to explain what he could see using reason. Thales is considered to be the first person to make a mathematical discovery. His discovery is aptly named Thales's theorem. If there exists a circle with points A, B, and C about it's circumference, and AC is a diameter, then ∠ABC is a right angle. Thales theorized that earthquakes were not a result of divine intervention or other supernatural forces, but rather that the earth floats in an ocean of water, and that earthquakes are a result of waves crashing into the earth. This page was last modified on 22 March 2019, at 15:54.